In the last post, “The Comb in the Museum,” I described the differences among works of art, art, andeveryday experiences. I suspect I do not have to convince you, the dedicated readers of these posts, that your own perceptive analysis of a work of art will produce aesthetic understanding of the color statement embedded in its subject. That said, I also suspect you may still have questions about how to assess creativity or determine originality. I have not directly tackled these concepts yet, although I have hinted at them. 1. Each artist was around 30 when he moved to Rome: Poussin in 1624 and Twombly in 1957. 2. Each spent a majority of his life in Italy and became a famous painter of his era. 3. When each was 64, he created canvases of the four seasons. 4. Poussin is one of Twombly’s heroes. 5. 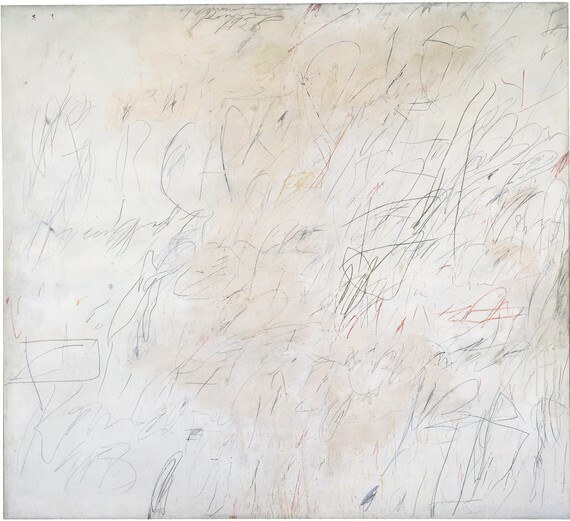 Twombly’s painting, Arcadia, made in 1958, features the word Arcadia scrawled across the canvas. 6. 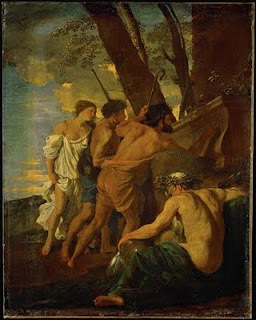 Poussin’s painting, Arcadian Shepherds, from about 1628, depicts shepherds coming across a sarcophagus and deciphering the inscription etched on it, “Et in Arcadia Ego” (even in Arcadia, I exist). Perhaps Woody Allen will write a sequel to “Midnight in Paris” and portray Twombly slipping back into the seventeenth century so he can meet his idol. I ask you to examine the following two paintings. Write an objective analysis comparing and contrasting them. Send me your response via e-mail (click here for address). I will select one response, post it here (with your permission), and mail the writer a copy of my book Edward L. Loper, Sr.: The Prophet of Color. The deadline for your entry is July 21. 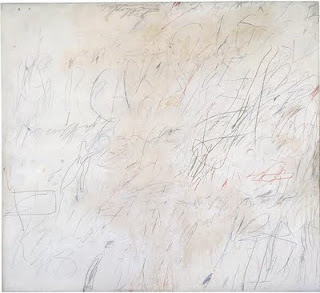 Since both images are digital reproductions, take into consideration the impossibility of seeing the nuances of tiny detail—scratches, penciled fragments, etc.—in Twombly’s picture. I am asking you to consider objectively the reasons given for the comparison of these two artist’s work. If you think they are good reasons, say why. If you think they are not, say why not. Once I post the response, and you have a chance to review it, I will begin a series of posts describing the role the traditions of art play in the development of an artist’s form. I will use Edward L. Loper, Sr.’s paintings as the objects of study.